"Pride Motivates All To Achieve Excellence." 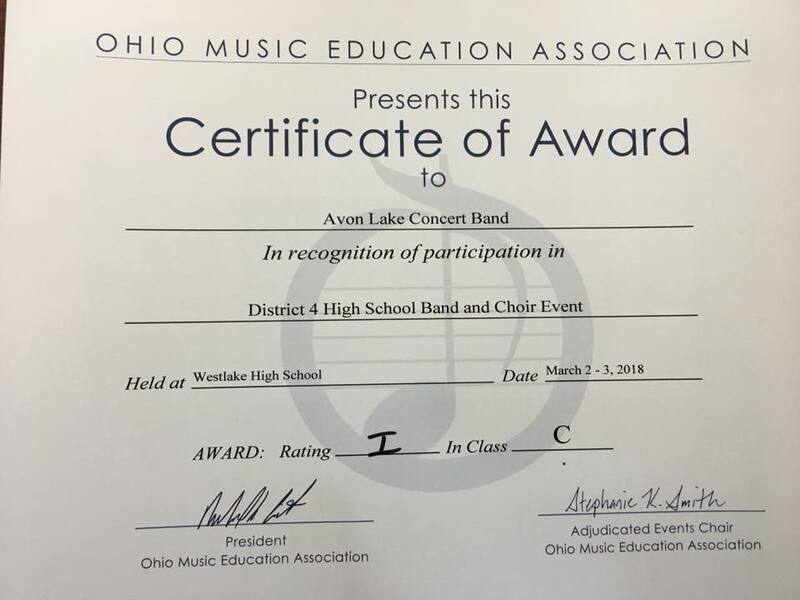 Symphonic Band Earned Superior Rating in Class AA at OMEA Large Group Adjudicated Event at Westlake HS. Congratulations to our students and director! Congratulations to all of the outstanding bands that attended our show. Thank you for choosing our show and please come back again next year! The Symphonic Band will perform at Orchestra Hall in Chicago on March 23, 2019! Natalie Miller is starting her senior year at Avon Lake High School this fall as the newly elected President of the high school band. Band students hold elections for officers each year prior to summer vacation with their terms effective on the first day of the next school year. But for Natalie, her new responsibilities began almost immediately as she helped to coordinate the annual “Kick-Off” for the band on the last day of school last June. She helped organize the event and helped introduce all of the incoming freshmen to life in high school band. “Freshmen are all expected to participate in marching band because it’s fun, it engages them in school and community service, and it helps them adjust to the demands of high school band musicianship.” Beyond that, it is an environment where freshmen get to work side by side with upperclassmen like Natalie. Students and parents see almost immediate positive changes in their children after only several days of summer rehearsals with the band. Why is that, you ask? Take a look at what Natalie has been doing the past few years and you soon learn why band plays such a big role in preparing newly arriving students for high school. She has been recognized for her academic work in Chinese, Geometry, Precalculus, and has earned the Summa Award every year. Natalie maintains a nearly 5.0 weighted grade point average. She is a member of National Honor Society, Model UN, and Chinese Club. She has participated in Key Club and Academic Challenge. And that’s just what she does in school. Outside of school, Natalie works at the Avon Lake Public Library, plays recreational softball, and is a member of the prestigious Cleveland Youth Wind Symphony. Natalie is the daughter of Thomas and Jennifer Miller. 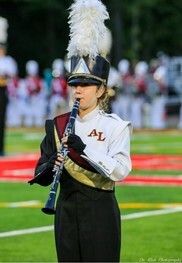 According to Avon Lake High School Band Director David Eddleman, Natalie is not the only student in band who excels academically, but instead represents a familiar trend. “I always kid around saying that some of the brightest students in the building are members of the band, but actually it’s true. There’s a culture in band that respects academic achievement, diversity, and the feeling that we are family. I can’t imagine more fun or rewarding work than what I do each day with these students”, Eddleman says. 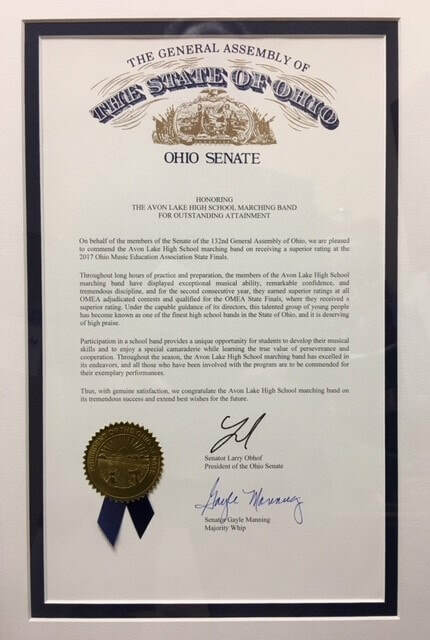 The Avon Lake Symphonic Band has been invited to perform at the PERCY GRAINGER FESTIVAL at Chicago's Orchestra Hall on March 23rd, 2019! 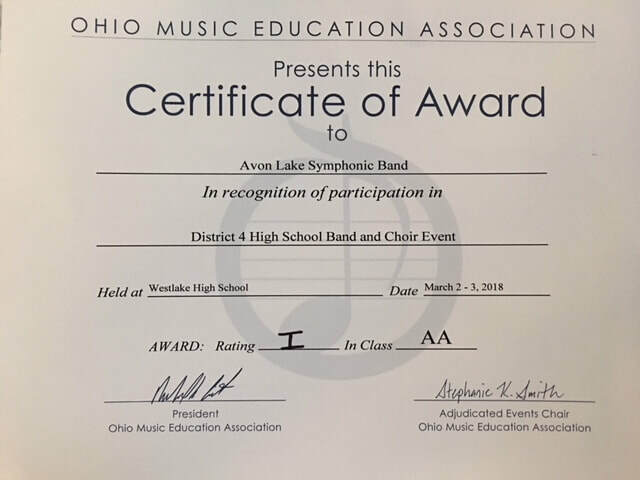 Congratulations Symphonic Band and Concert Band for earning Superior Ratings at the OMEA Large Group Event at Westlake HS! 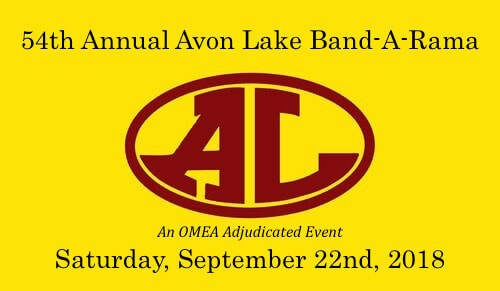 The Avon Lake Band Aids have created a scholarship fund for students needing assistance for educational and life-changing events such as the CYWS, indoor drumlines or guards, a DCI corps, or summer music camps. Download the scholarship application and submit it to Mr. Eddleman. The scholarship committee meets two to three times per year as needed. For the second year in a row, the Marching Shoremen were awarded the top rating at State Marching Band Finals! Congratulations to the band members, 8th grade helpers, staff, parents, and supporters!